Readers Question: What are the effects of the exchange rate on UK businesses? A depreciation (devaluation) will make exports cheaper and exporting firms will benefit. However, firms importing raw materials will face higher costs of imports. An appreciation makes exports more expensive and reduces the competitiveness of exporting firms. However, at least raw materials (e.g. oil) will be cheaper following an appreciation. If there is a depreciation in the value of the Pound, it will make UK exports cheaper, and it will make imports into the UK more expensive. 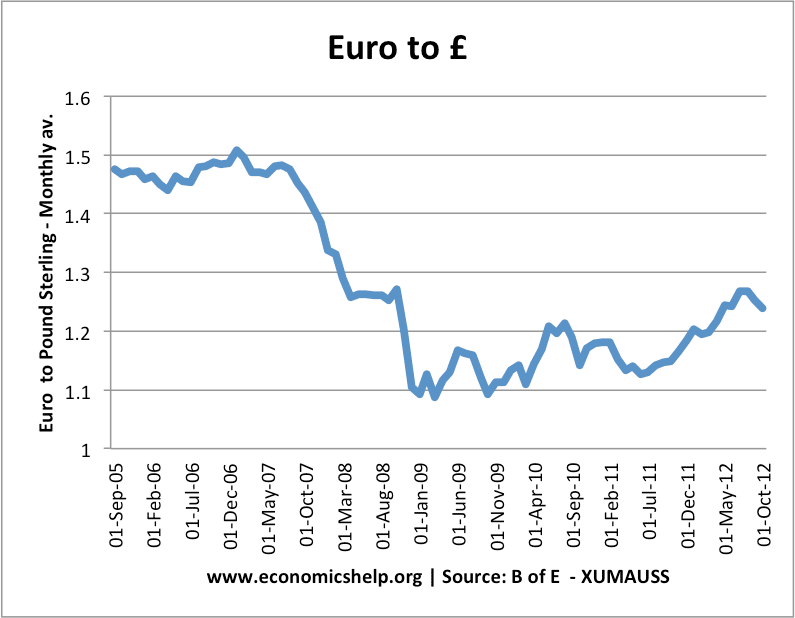 At the start of 2007, the exchange rate was £1 = €1.50. Suppose a British car costs £4,000 to build and sells for £5,000 in the UK. The 26% depreciation means that European consumers now find British goods much cheaper. The cost of producing the car stays the same (assuming parts are not imported), but the effective market price in Europe has fallen. This should increase demand for British goods. A British firm has a choice, it can reduce the European price from €7,500 to €5,500; this should lead to an increase in the quantity sold, and increase UK exports. Alternatively, the firm could keep the price at €7,500 and just make a bigger profit margin. It is a good choice for exporters to have – reduce European price and sell more or keep price the same and make a bigger profit margin. The downside of a depreciation is that British firms who import raw materials will see an increase in the cost of buying raw materials. If the British car company imports engines from Germany to make the car, it will have to pay more to buy the engines. This will reduce its profit margin. Suppose an engine costs €1000 to import from Germany. In 2007, this costs £666 (1,000/1.5). In 2009, with the fall in the value of the Pound, they will have to spend £909 (1,000/1.1) to buy the same German engine. In the long term, it is argued that a depreciation may reduce the incentives for exports to cut costs. The depreciation enables an ‘easy’ increase in their profit margin. As a result, there may be less incentive to cut costs and boost productivity. If a firm is facing an appreciation, then they may face a greater incentive to cut costs. Exports will be more expensive. This will lead to lower demand for UK exports or firms will have to reduce their profit margin. Imports will be cheaper. The import of raw materials will be cheaper. The effect of the exchange rate on business depends on several factors. 1. Elasticity of demand. If there is a depreciation in the value of the Pound, the impact depends on the elasticity of demand. If UK firms are selling goods which are price inelastic, then the fall in their foreign price will only have a relatively small increase in demand. If exports are price sensitive, then there will be a bigger percentage increase in demand. Evidence suggests that British goods are increasingly price inelastic and after a depreciation, there is a relatively small increase in demand. 2. Economic growth in other countries. 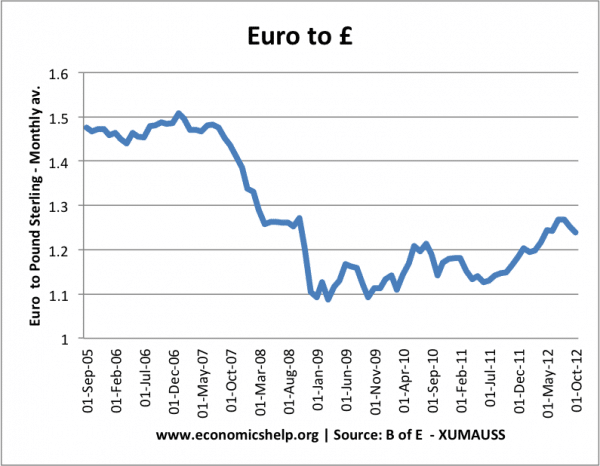 In 2009/10, there was a significant depreciation in the value of the Pound. However, the global economy (and EU in particular) was in recession, therefore, demand for UK exports remained weak – despite the lower price. 3. Depends on the percentage of raw materials imported. If a UK firm imports raw materials and sells to the domestic market, it may lose out from a depreciation. If a firm imports only a small percentage of raw materials from abroad and sells to Europe, then it will benefit more from a depreciation. 4. It depends why there was an appreciation/depreciation. If there is an appreciation in the Pound because UK labour productivity is increasing, then firms are likely to be able to absorb the stronger Pound. However, if the Pound rises due to speculation or weakness of other countries (e.g. Euro crisis in 2011) then firms may become uncompetitive because the rise in the value of Pound is not related to increased productivity and competitiveness. 5. Inflation? One possible problem of a depreciation is that it could cause inflation. (for more details see whether depreciation causes inflation) If inflation does result, then firms could face costs, such as greater uncertainty. 6. Fixed contracts. Many business use fixed contracts for buying imported raw materials. This means temporary fluctuations in the exchange rate will have little effect. The price of buying imports will be set for up to 12 or 18 months ahead. Exporters may also use future options to hedge against dramatic movements in the exchange rate. These fixed contracts help to reduce the uncertainty around exchange rate movements and mean there can be time lags between changes in the exchange rate and changing costs for business. This entry was posted in business and tagged business, exchange rate. Bookmark the permalink. Thx for giving me good data. Clearly explained the effects of currency fluctuations on import and export. Thank you very much! Thank you so much for such an easy-to-understand script. It has actually erased all the confusion about the subject from my mind. When US preferences for foreign goods weaken, what effect does this have on the exchange rate? Less demand for foreign goods will mean a reduction in supply of dollars (to buy Euros) so ceteris paribus, we would see a rise in value of dollar. Thanks a lot for the help, really enjoyed working with you.